Please stop by SkyWatch Friday to view amazing sky photos from around the world. Anyone who has been following my blog knows that I have been experiencing a flood of stormy emotions of late. And as is often the case, my inner world reflects the outside world (and vice versa). 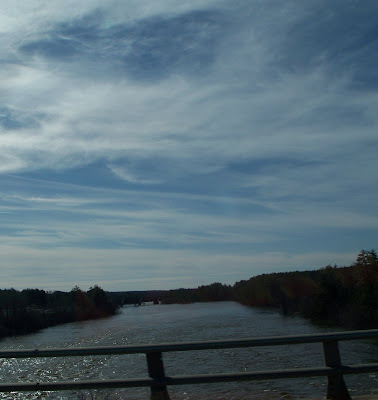 We had a nor’easter last weekend that caused the rivers to swell and pour out onto the flood-planes in Southern NH. I don’t know if I am in the eye of my personal storm or if it has truly passed but I am noticing a lightening of my heart today. The tears have watered and nourished the land of "me" and I feel ready for something new to grow. 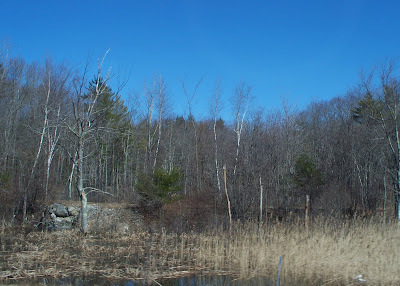 Perhaps it is the sunny blue skies and spring-ish weather…perhaps it is my metta practice…or maybe it is a combination of these two things plus a good cry in the car on the way home from my neuro-psych appointment on Tuesday afternoon. I was told officially: “No driving at night or in bad weather. No driving more than half an hour at a time or to places that are unfamiliar to you (me)”. I was hoping this recommendation would change after the doctor reviewed my stellar test results…no deal. He explained that while my ability to learn and remember is still in good shape at this time (not always the case for people with MS)…my “working memory” is not. This means that in order to understand new information I have to write it down, ask questions and otherwise find ways to repeat the new data for it to stick. He also told me multi-tasking is a major no-no. If I want to fully comprehend and remember what is being said, then a quiet space is essential. Having something else on my mind, or receiving extra audio or visual input-like radio or TV or being in a “busy” environment when someone is talking to me reduces my ability to pay attention, understand and remember. Even cooking while on the telephone-you know stuff most Mom’s do- is not a good idea for me if I want to hold on to new information and maintain enough focus so that I don't burn dinner. That’s assuming I actually have the energy to prepare it in the first place! Maintaining focus when there are multiple distractions is hard for most people...but for a person with a working memory deficit it's a little like being buzzed from one drink too many. My daughter Belin used to have T-shirt that said: "Distracted by Shiny Objects". Lately I'm thinking that shirt was meant to be worn by me! So of course I could say that the combination of overwhelming fatigue and the glitch in my cognitive functioning due to MS are perfect excuses for getting little done in a day…and that is true (believe me! )…and yet, I also see this as the universe aligning to tell me to be more present. Focus on ONE thought, ONE task, ONE person, ONE intention at a time. All the more reason to practice meditation!!! Metta seems to be a really good fit right now as I must make friends with this situation, with this disease that has altered my life and the lives of my family forever. In a conference call last night, one of the notes I jotted down that Sylvia said was this: “I am safe in my benevolent heart.” I love that! What a relief. The world can be wild and windy around me, waters rising unexpectedly, life circumstances spewing all kinds of unpleasantness in my direction, my own emotions in a complete tailspin and yet “I am safe in my benevolent heart”. If I can remember that, remind myself of that by cultivating a habit of lovingkindness through metta...then I will always have a safe island sanctuary to return to within my own being. Because it was an absolutely gorgeous day and because we are "in training" for the MS Journey of Hope Walk we are participating in in May, Rosie took me for a walk/ride in the neighborhood today. We were on a mission to find a blooming crocus...and we did...isn't it lovely? How can I not be happy discovering the first tiny crocus right at the bottom of our hill? May we all feel safe. May we all feel happy. May we all feel strong. May we all live with ease. 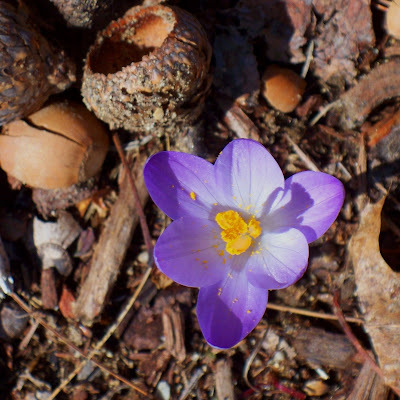 That perfect little crocus is the beauty of what is, among the debris of what was and the unknown of what will be. "I am safe in my benevolent heart." I am going to borrow that for my new soothing mantra as I go to sleep at night. I begin my nighttime ritual, once my head hits the pillow, with the metta blessing for those who have asked for prayers and those who have shared with me that life is difficult right now. Then I breathe deeply and say thanks for all my blessings. May each one of us feel safe, happy, strong, peaceful, and at ease. Blessings to you, Laura. There's beauty all around us here today, from those amazing skies to the precious crocus. There's just something about looking upward for inspiration, especially. The skies, the stars, seem to hold such hope. I come, I read, I appreciate your insight. Comment? There is so much here to think about I wouldn't know where to begin. For your emotions, your photography, your words, the MS, your reflections, for the gift of you, I say 'precious'. Compassion practice is softening me. I care about your memory. May I hold your fear with kindness and ease. May we all forgive and cherish our humaness. I love things that bring me present, art is often like this. your crocus image is wonderful, bright new color amongst the remnants of winter. The photographs are all so beautiful. Nothing like the first crocus. My crocuses bloomed a few weeks ago which lifted my spirits. Take care and I hope you have a good weekend. i AM a photographer, don't do it for living. am doing it for pleasure, it's a passion. i'm bipolar and noted your artsy folk comment. i believe your right there with the note that many people with different brain disorders are more creative (on arts) than median. found a list on the net that claims, pretty much, every artist from Van Gogh to Curt Cobain was bipolars. that's looking retrospectivly, at the time many was just concidered (bit?) crazy but was tolerated because of the superb artistic skills. some even made few bucks. retrospectivly at least. i concider that i have a gift (artistic talent) but it comes with hefty pricetag (bipolar). let's just say "we" don't die of an old age. me figures that's pretty stiff. but what can one do? but exept it and try to cope with it the best one can. lil' happiness every now and again is a plus. maybe rare but still. Beautiful skies and crocus, happy spring! Your photos are amazing, friend. God bless. Lovely shot! Like the sun glistening on the water in the lower left of your image - may hope abound for you and bring you light. Lovely sky shots and that crocus is like a breath of fresh air...spring must be right around the corner. It is a beautiful, beautiful crocus, yes. And I can't believe that sky could be so blue, but I know it to be true because I've seen that same intensity here lately. “I am safe in my benevolent heart” I will be saying that today. “I am safe in my benevolent heart” everything seems to be alright when I think on those words. And I am safe. And may you be too, now and always, Laura. I really love what Debra said: That perfect little crocus is the beauty of what is, among the debris of what was and the unknown of what will be. You have such a gift for sharing your world and helping others to explore theirs. I have fibromyalgia and sensory overload is a problem for me, so I understand a bit of what you say about not having a lot of distractions. I get what they call "fibro fog" when there's too much sensory input. Isn't it amazing the wonderful gifts that "illness" can teach us? Slow down, pay attention, take care, be good to your self, be safe in your benevolent heart. Much love to you, Laura! Thank you everyone for your thoughtful, heartful comments. I know I am truly blessed to be part of this beautiful worldwide blogging community. I am so happy to know that my writing and images resonate for so many of you...the same is true for me when I visit your blogs.